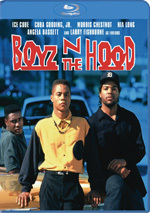 For a drama that looks at Los Angeles law enforcement and gang activities circa the late 1980s, we go to 1988’s Colors. Veteran LAPD Officer Bob Hodges (Robert Duvall) gets a rookie assigned to him, so he partners with young cop Danny McGavin. Hodges and McGavin work as part of LAPD’s anti-gang division, and their job takes them to the mean streets of South Central. There they deal with the divisions among the Crips and the Bloods, so the officers need to calm the tensions – and keep themselves safe as well. When Colors hit screens in 1988, I remember the movie came with a lot of hype. It promised to give us an unvarnished look at the violent reality of gang life, and this made it a hot property – though not one that really prospered. While Colors got largely good reviews, these didn’t translate into anything major in terms of awards, so the movie netted zero Oscar nominations despite the talent involved and the timeliness of the story. In addition, the film made money – partly due to its low budget – but no one viewed it as a box office smash. Viewed almost 30 years later, Colors borders on quaint. Okay, that’s an exaggeration, as the film paints a realistic enough portrait of gangs that it continues to boast relevance – this isn’t some goofy fantasy West Side Story take on gangs. That said, I can’t exactly call Colors hard-hitting or edgy, at least not circa 2017. I know I saw the film back in 1988, but I can’t recall what I thought of it then, so I can’t comment on my own view of its impact or bite at that time. In 2017, though, Colors tends to look pat and cliché. This material may have passed for tough and revealing in 1988, but nowadays it just looks silly. Make no mistake: despite the film’s attempts to seem biting, Colors offers little more than one-dimensional melodrama. The movie embraces every cliché you can dig up for this sort of tale, from the cops to the gangs to everyone in between. Colors follows the Lethal Weapon template more than I suspect its creators would like to admit. While Colors lacks the 1987 film’s comedic side, it still trades in the same stereotypes, especially in terms of the relationship between the leads. Hodges and McGavin come across as nothing more than the usual mix of experience and youth. Hodges is the wise old cop – close to retirement, of course – while McGavin is the hot-headed newbie who thinks he knows everything. Expect nothing creative from these characters, and despite their ample talents, neither Duvall nor Penn can do anything with their trite roles. They show little connection to each other and find themselves stuck in neutral as they try to work out their one-note parts. The supporting roles don’t fare any better, as Colors sticks us with every ghetto stereotype it can find. It’s fun to see a young Don Cheadle as one of the main gang members, but beyond that novelty, there’s not much of interest to be found. Colors loses most of its points due to its inability to fulfill its promises. While the movie wants to be a dynamic exploration of reality on the street, it ends up as basic campy melodrama. The film provokes a surprising number of unintentional laughs as it digs into one silly moment after another. All of this occurs while those involved clearly believe they’re making an important movie. Colors comes with delusions of social relevance that inform most of the tale. 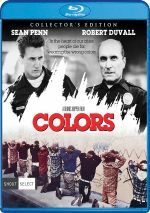 Instead of a film that gives us a believable version of its cops/gangs subject matter, though, Colors winds up as a pedantic tale that lectures us far too often. Add a heavy layer of campy melodrama and the movie doesn’t hold up after almost 30 years. Colors appears in an aspect ratio of approximately 1.85:1 on this Blu-ray Disc. Expect a decent but dated transfer. I discerned no problems related to jagged edges or moiré effects, and edge haloes created no distractions. Print flaws turned into a more persistent concern, though, as a mix of specks and marks crept into the image. While not dominant, these appeared on a fairly frequent basis. Colors tended toward a natural – if low-key – palette. The hues worked pretty well, as the tones seemed pretty full and clear. Black levels appeared reasonably dark – if a little too thick at times - while shadow detail presented acceptable delineation. The image remained perfectly watchable but it could’ve used a clean-up. Though not great, DTS—HD MA stereo soundtrack of Colors held up fine given its age. The soundfield boasted pretty good stereo presence for the film’s synth-based score, and effects broadened to the sides in a positive manner. These elements fared best in the handful of action-oriented scenes, as those allowed material to move across the speakers well. Environmental information also used the channels in a satisfying way, as street and beach scenes brought us well-depicted breadth. Effects seemed similarly positive. Some elements - such as explosions and gunfire - displayed nice bass, and overall accuracy was fairly good, though a little distortion popped up at times. Nothing here excelled, but the soundtrack seemed better than average for its age. Only a few extras pop up here, and we get a featurette called Cry of Alarm. This runs 28 minutes, 46 seconds and presents an interview with screenwriter Michael Schiffer. He discusses how he came onto the project and his original pitch, research and writing the script, story/characters, cast and performances, the movie’s impact and legacy. From start to finish, Schiffer covers the movie well. He gets into a nice variety of subjects and does so in a lively, engaging way that makes this an informative and enjoyable chat. In addition to the film’s trailer, we get a program called Cops & Robbers. It lasts 16 minutes, 53 seconds and includes notes from LAPD Gang Division/technical advisor Dennis Fanning. He talks about his career in law enforcement and his work on Colors. Fanning offers a blunt, profane and thoroughly delightful discussion of life as a cop in this strong chat. Back in 1988, Colors came across as gritty and hard-hitting. In 2017, though, the movie looks naïve, melodramatic and campy. The Blu-ray provides erratic visuals as well as pretty good audio and two good interviews. As a movie, Colors has aged poorly.